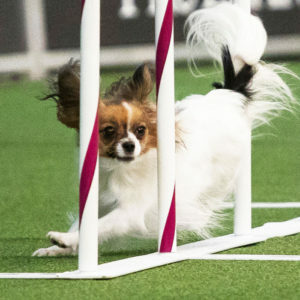 A tiny papillon named Gabby may just give greyhounds a run for their money. On Sunday, the nimble pooch zoomed through an obstacle course at the Westminster Kennel Club Dog Show’s Masters Agility Championship in only 39.31 seconds. A video from that championship, which Gabby won, shows the 3-year-old dog rapidly conquering one obstacle after another with a seemingly endless burst of energy. Andrea Samuels, Gabby’s trainer, had to race after her to try to keep up. Even after Gabby completed the course, she still wasn’t tired and began celebrating by jumping all over Samuels in excitement. Read more. Barbie is once again getting a makeover to become more inclusive. In the fall, Mattel plans to release the Fashionista line, which will feature Barbie dolls with braided hair textures, diverse body types, and disabilities, including one Barbie with a wheelchair and another one with a prosthetic leg. The Barbie team at Mattel worked with UCLA Mattel Children’s Hospital and Jordan Reeves, a 13-year-old girl with a prosthetic arm, to create Barbies with disabilities. Mattel found that Barbie fans wanted more inclusivity and more realistic depictions of various bodies, and the brand listened and delivered. Read more. Pink may have lost the 2019 Grammy for best pop vocal album, but she sure wasn’t left empty-handed. The singer’s 7-year-old daughter, Willow, gifted her with a tinfoil Grammy award, which was made by Pink’s husband, Carey Hart. Pink posted adorable photos of her children holding the “Grammy” on Instagram. This is Pink’s 17th tinfoil Grammy, as her husband makes one for her every time she loses. With a heartfelt gesture like that, everybody wins. Read more. What can an art teacher do to relieve the stress of four dozen frazzled middle school students? Why, introduce a little Bob Ross, of course. 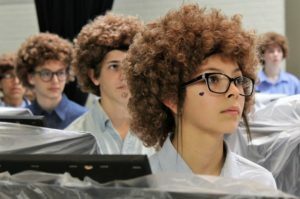 When Brady Sloane began to notice how much her students were stressing over their school workload, she took it upon herself to organize an epic art extravaganza — a Bob Ross flash mob. Thanks to a successful fundraiser, Sloane was able to order enough paint (and assorted Bob Ross wigs) for all 48 low-income students. The excited kids painted away their stress while they followed along with Bob Ross’ videos. Read more. Inspired by his 6-year-old deaf niece, Roy Allela, a Kenyan inventor, created gloves that translate sign language into audio. The gloves, known as Sign-IO, have flex sensors that are able to recognize the movement the hand is making as it signs. Then, the information from the gloves is sent through Bluetooth to an app that audibly recites what was signed. 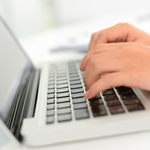 Users can customize the speaking voice and glove design according to their preference. Allela hope to provide the innovative gloves to special needs schools throughout Kenya. Read more.